Whenever someone starts complaining about remakes being no good, I bring up Sorcerer. 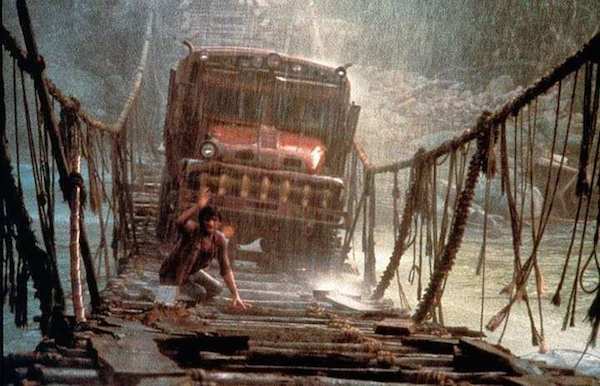 Sorcerer is a 1970’s remake of the French suspense classic The Wages of Fear, one of my favorite films of all time. Sorcerer is different enough from the original to be its own thing, and thus it is amazing in its own right as well as being a worthy heir to the Wages of Fear mantle. Sorcerer is a film about a team of down-and-out foreigners in South America, whose luck turns when an oil well catches fire. The only way to extinguish the oil fire is an explosion that will smother the flames, and the only way to generate that explosion is to haul a couple trucks full of dynamite over the mountains. The problem is that the dynamite is leaking nitroglycerine, which will explode upon experiencing any physical shock. Thus, the team of men who drive these trucks very carefully over the dangerous mountain road must be both money-hungry and expendable, and so that’s where our protagonists come in. The film is a master class in tension, and it would probably be a classic of the 1970s if it weren’t for the fact that it opened in theaters against a little movie called Star Wars. Did I mention it was directed by The French Connection‘s William Friedkin? And it has Roy Scheider. And a bizarro soundtrack by Tangerine Dream. And a brand-new, gorgeous Blu-Ray release. Yeah, you should see this one. Continuing with my Bollywood recommendations, this is an accessible film for a first time Bollywood viewer. Starring the incomparable Shah Rukh Khan, this is a spy/action/fish-out-of-water/prodigal son movie. It’s Bollywood, so it is ALL THE GENRES! Shah Rukh stars as the super spy sent undercover as a college student to protect a government muckety-muck’s daughter. The action scenes are beautifully over-the-top, some wonderful visual comedy (especially the violins! ), plus Shah Rukh Khan cries more beautifully than any man ever.